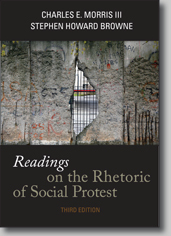 Morris and Browne, Readings on the Rhetoric of Social Protest, 3 ed. This highly acclaimed anthology includes thirty-five of the most significant essays from the literature. From groundbreaking theoretical works to very recent case studies, the selections reveal the evolution of a dynamic scholarship—its theoretical foundations, the debates that shape further inquiry, the critical studies that explore and illustrate broader theoretical perspectives. Drawing on a wide variety of recent and historical movements, these essays explore the rhetorical strategies that create leaders, inspire followers, confront power, attract public support and sympathy, and allow movements to adapt to changing conditions—or that silence dissent, suppress uprising, or discredit protesters. The third edition reflects current issues and theoretical perspectives, with an enhanced emphasis on contemporary social movements. Substantive introductions to each chapter highlight key points, vital themes and connections, and recurring conflicts. A selected bibliography—updated and expanded in this edition—helps students launch their own research on social movements. Previous editions of this book were reviewed in The Review of Communication and Rhetoric and Public Affairs. "I love this book and think that it is singular, and singularly important, to the field." "It was and still is the best available anthology, a handy repository of both classic and leading-edge scholarly essays in the area." "The book includes many of the foundational articles in our field. These are important texts for beginning students and they are written in a manner that is accessible for college juniors and seniors. It has a good variety of case studies from excellent scholars in the field." "The revisions offer case studies of more contemporary movements and a more critical/cultural vocabulary for looking at social movement rhetoric." "Many excellent essays, especially case studies. Nice intros to sections. Nice blend of theory with critical case studies." "As soon as I saw it, I knew it was exactly what I was looking for. Finally, a comprehensive collection of seminal articles in the field." "Loved it. Great selection. Best I’ve seen for the subject." "The Morris and Browne text is the gold standard for a reader on social movements within rhetorical studies. It has been an excellent volume for my course on social movements, picking the best of rhetorical scholarship on social movements and providing a coherent framework for engaging these texts." "This set of readings represents some of the best scholarship on social movements from a rhetorical perspective. It provides a strong theoretical framework, as well as particular case studies. Given the diversity of essays, which examine different types of movements and aspects of movements, my students are able to see the myriad ways to study movements rhetorically." "Wide variety of readings. Important definitional articles are included." "Nice balance of theory to application. Excellent topic diversity. Special benefit: looking at protest from all angles (inside, outside, over time, etc.)" "It is useful to address major social movements across the spectrum, so I appreciate the fact that the book includes African American, Mexican American, Native American, women, gay rights, etc., as case studies." "I like the book for examples of rhetorical criticism that focus on issues that are interesting to me and my students, namely, race, gender, environment, queer theory." "The revisions—in my mind—make the volume even more useful in that they not only expand some of the major sections (conceptual and historical) but also bring the volume into contact with more recent movements—like animal rights, Chicana rights, and HIV/AIDS activism." "[Major strengths include] the strong sense of the development of the field over time." "Nice array of pieces written at different times and about different times. The specific case studies are separated into useful sections, while also not having been forcibly developed just for those sections. Thus each case study speaks to multiple concerns, but is paired in ways that suggest key insights." "The book allows for wide-ranging discussion and theoretical depth without the didactic tone of a 'textbook'." "The editors’ introductions to each chapter were also great, since they provided context for the essays and an orientation to the conversation in which they engaged." "The bibliography helps students with their projects and these sources are also very useful as supplements to the essays assigned for class." "The bibliography is a great resource for students to find sources on their final papers." "It brings together, in one convenient place, some of the most important scholarship on the rhetoric of social movements, historical and contemporary, classic essays and cutting-edge criticism." "Morris and Browne have gathered the best collection of essays on principles of theory and rhetoric of social movements that I have seen." "The quality of the scholarship and the areas covered in the book are outstanding." "I do value the contribution this book makes . . . . The collection of theory essays [in Section I] remains a strength of the book." "[Section II] offers a fine cross section of critical essays, providing a student with the sense of the diversity of topics and approaches that can be taken in the rhetorical study of social movements." "[This book] is an excellent idea. There is a real need for such a volume." "In this field, the important work in social movements is now being done through case studies. This makes the last section especially important. The choices in this section are fine examples of criticism." "The book [has a] specific and realistic discussion about movement theory and criticism drawn directly from the field." "Articles selected for the text clearly offer a wide range of rhetorical perspectives through each major section. I was [also] impressed with the selection of readings for the 'competing and 'critical' sections. I would adopt the proposed text as a required text for my course. It includes many of the essays I now require graduate and undergraduate students to read and critique." "I believe this text will ultimately be adopted as a required text for many social movements courses." Charles E. Morris III is Professor of Communication and Rhetorical Studies and of LGBT Studies at Syracuse University. He has a B.A. from Boston College. He received his M.A. and Ph.D. from The Pennsylvania State University. He is the cofounding editor of QED: A Journal in GLBTQ Worldmaking. His books include Queering Public Address: Sexualities in American Historical Discourse (2007), Remembering the AIDS Quilt (2011), and An Archive of Hope: Harvey Milk's Selected Speeches and Writings (2013). His essays have appeared in the Quarterly Journal of Speech, Communication and Critical/Cultural Studies, Rhetoric & Public Affairs, and elsewhere. For his work as an archival queer, Professor Morris has received two Golden Monograph Awards, the Karl Wallace Memorial Award, and the Randy Majors Memorial Award from the National Communication Association. Stephen Howard Browne is Professor of Speech Communication at The Pennsylvania State University, where he teaches courses in rhetorical theory and criticism. He received his B.S. from the University of Oregon, his M.A. from Colorado State University, and his Ph.D. from the University of Wisconsin. He is the author of Edmund Burke and the Discourse of Virtue (1993), Angelina Grimke, Rhetoric, Identity, and the Radical Imagination (1999), and Jefferson's Call for Nationhood: The First Inaugural Address (2003). He has published more than thirty essays in the history and criticism of rhetoric in the Quarterly Journal of Speech, Communication Monographs, Rhetoric and Public Affairs, and other journals. Professor Browne has received the National Communication Association's Diamond Anniversary Book Award and the Karl Wallace Memorial Award.